Western horizon around 10 am, March 1. 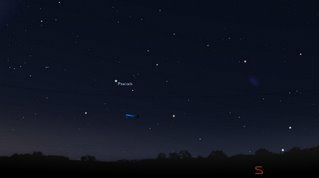 March's Southern Skywatch is up. 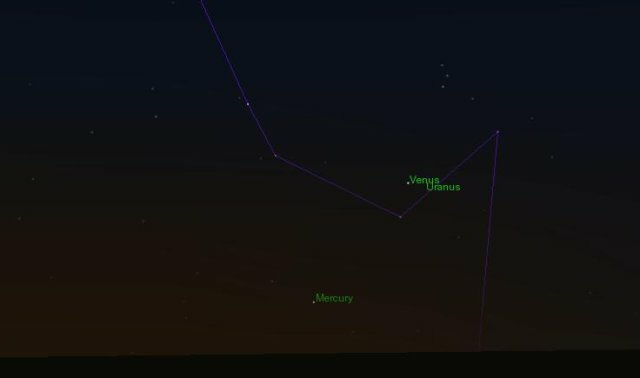 This month, a lunar eclipse, the Moon near Mars and Venus, and the best morning appearance of Mercury this year. New Horizons meets Red Spot Jr.
New Horizons successfully made its close approach to Jupiter. 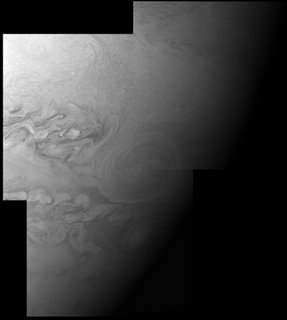 It has produced the best image of Red Spot Jr. yet and imaged Europa and Ganymede. It also picked up an eruption on Io. New Horizons will continue to image the Jovian system as it heads out to Pluto. Image Credit NASA/John Hopkins University. (click to enlarge). The New Horizons spacecraft will make its closest approach to Jupiter in 16 hours from now. It will use Jupiters gravity to slingshot itself across the Solar System to Pluto and the Kupier belt. This will slow Jupiters rotation by a minute fraction. 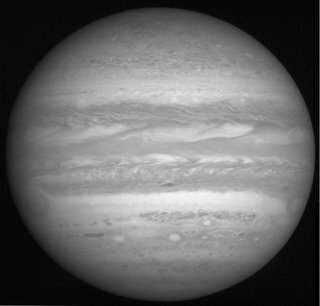 At the moment the spacecraft is gathering impressive images of Jupiter. It will also survey Jupiters rings and follow Jupiters magnetosphere. The image to the left is a mosaic of 4 images from the Long Range Reconnaissance Imager (LORRI). 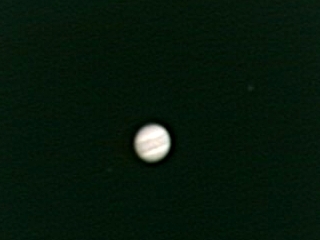 You can see the Great Red Spot on the lefthand side of the image, and Red Spot Jr on the far right of the image. Hopefully New Horizons can make more detailed observation of Red Spot Jr. See the LORRI gallery for more images. 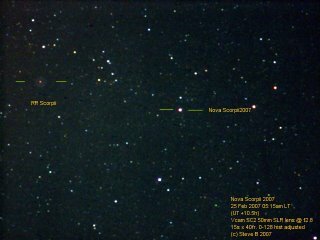 This image of Nova Scorpii 2007 ( V1280 Sco) was taken by fellow South Australian SteveB (click to enlarge, (c) SteveB 2007). A very nice field taken with a webcam (compare this with the binoculat map in the link above). Steve says to note that the stars are bloated due to a poor infrared (IR) filter on his setup. That's why the star RR Scorpii shows a ring around it, that is just unfocussed IR. Steve says because of this it is very misleading to try and do a magnitude estimate of the nova from this image. Anyway, visit Steve's site and have a look at some of the great images there. 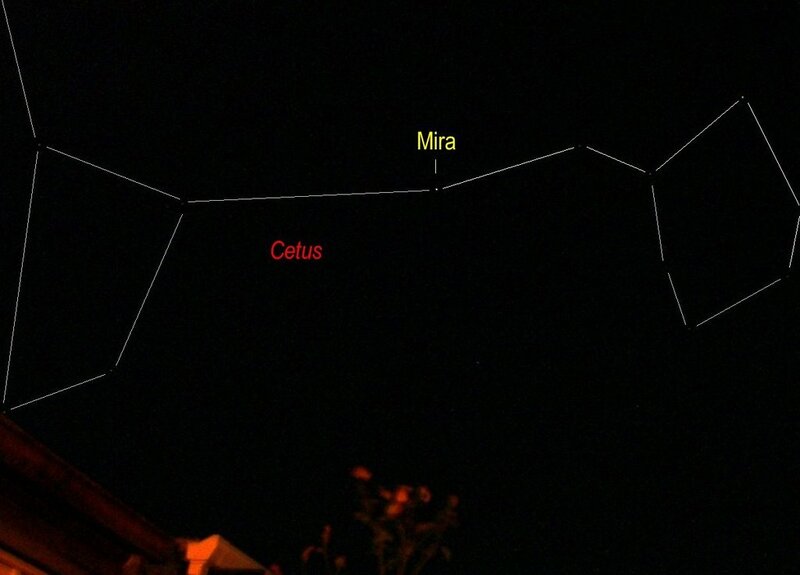 Mira imaged at 9:30 pm on Sunday. Click to enlarge the image. I have added the constellation outline to show where it is in the scheme of things. Mira is still reasonably bright (roughly magnitude 2) despite being past maximum brightness. Nova V1281 Sco is down to magnitude 9 at last report, so it really is a telescopic object now. I have updated my spotters map because I messed up the location of V1280 Sco. Go to this site to see a crocheted Dalek. I mean it. Makes me want to start crochet myself. What about a nice cyberman as well. Update on Nova V1281 Sco - No go. Got up this morning and hunted for nova V1281 Sco. V1280 was still readily visible, even to the unaided eye (very good conditions this morning), and still around magnitude 5.2. However, in the rough location of V1281 Sco there was nothing down to around magnitude 8. Guess it has faded then. Edit: Images on Ice in Space from avondonk show the second nova, it is definitely below mag 8. There is a nice field comparison in this thread as well. 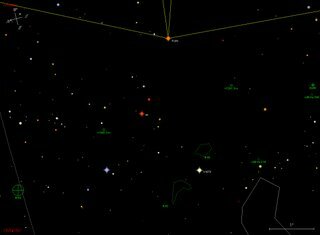 A second unaided eye Nova in Scorpius? Map of the eastern horizon in the Southern hemisphere at around 4:30 am (daylight saving time). 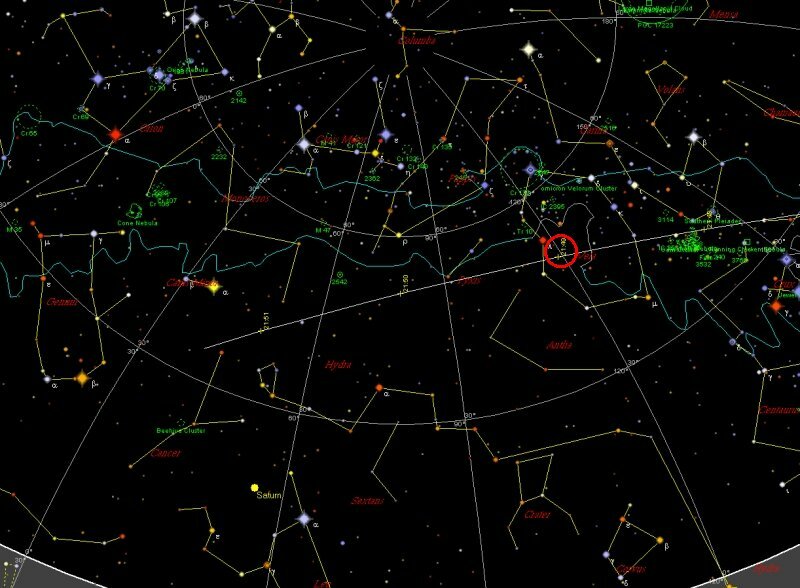 The circle shows the field of view of a pair of 10x50 binoculars, the red crosses shows the approximate location of the Novae. Click image for a larger map. Enlarged view, the area of the two novae, in roughly the field of view of 10x50 binoculars. The yellow circles show the location of the novae. 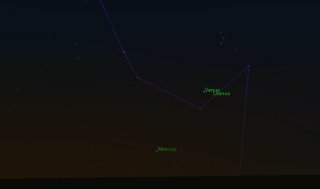 Stars are shown down to magnitude 9. 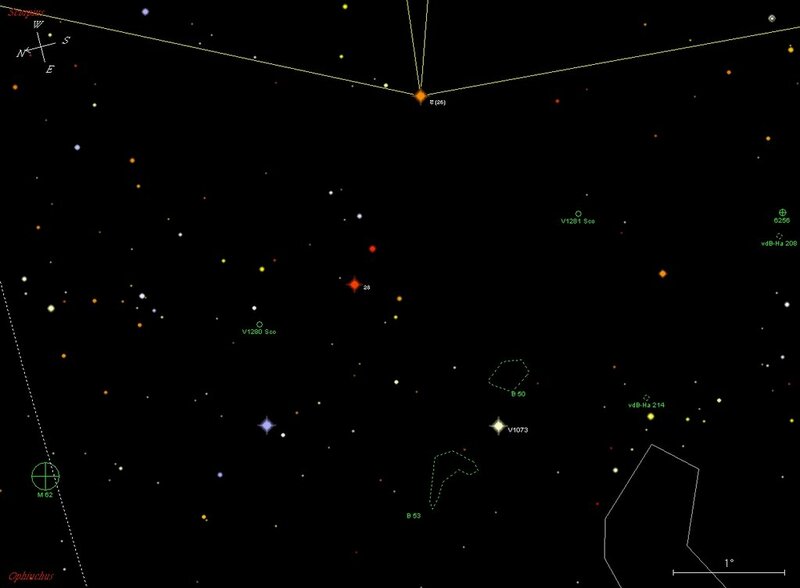 The novae, being 5.2 and 6 (or greater) magnitude respectively, will be about as bright as the reddish star near the middle of the field. Click image for larger map. 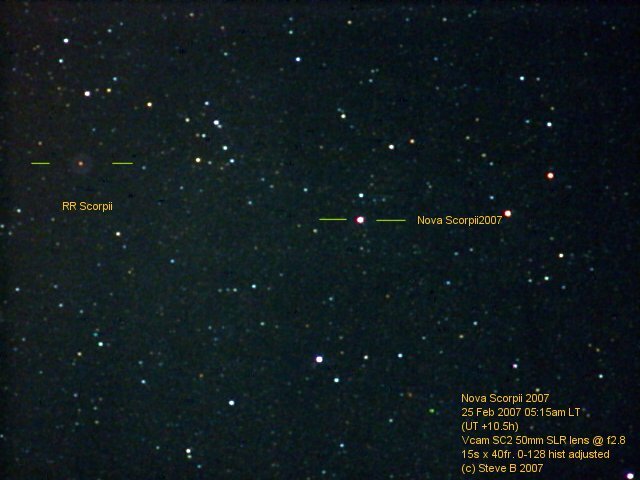 A second nova, V1281 SCO, has been found just 3 degrees from V1280 SCO, the unaided eye nova from last week. The second nova has brightened rapidly, and the last report had it around magnitude 6, the threshold for unaided eye visibility under dark sky conditions. What will happen now is uncertain. It might rapidly fade again, or it might continue to brighten. 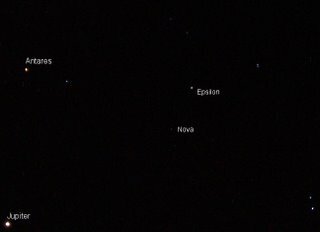 Anyway, take a look this and the next few mornings, if you are lucky you could see a second bright nova. At this stage observers are best advised to use binoculars to locate the nova. Nova V1280 is still bright enough to see with the unaided eye in dark sky locations, at magnitude 5.2 it is fading slowly. It will be a rare treat indeed to see two novae in the same field of view of a pair of binoculars. UPDATE EXPLANATION: I (laboriously) manually placed the red crosses in the previous version of the binocular map, and it turns out I slightly misplaced the V1280 Sco cross. Of course, if my brain was working, I would have used SkyMaps quick catalog to place accurate locations on the map in the first place, which I have done now for this version. Thanks to SteveB for picking this up. Rosetta, the mission to comet Churyumov-Gerasimenko, successfully completed its fly-by of Mars. Images were returned by the navigation cmarea and the Optical, Spectroscopic and Imaging system. Recent images can be seen here (the image bank should update soon). Gavitational manouvers such as the one Rosetta just completed are useful ways to reduce fuel needs on interplanetary journeys. However, things can often go badly wrong, with one comet mission disintegrating after an Earth flyby. Rosetta will flyby Earth in November, and reach the comet in 2014. For more information see the ESA press release and this background article. Delphius is a neat constellation near Aquilla the eagle. 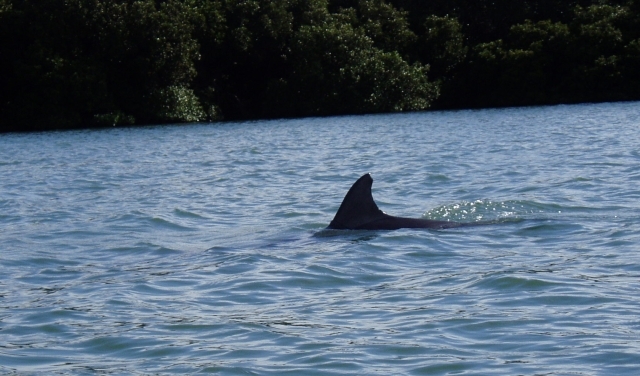 Its name is Latin for dolphin, and we got to see lots of its namesake today. 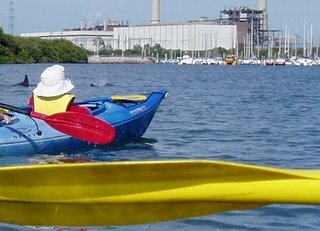 As I mentioned, the family took me out on a kayaking tour to celebrate my natal day. The days started out like many of the Chez Reynella trips, getting totally displaced on the way there. There are a lot of road works associated with the new Port freeway, and somehow our turnoff disappeared into a maze of detours and road works. But we got there in the end. We were soon fitted out with life jackets and pretty fancy kayaks. The Betdeckererschnappender weisle and I have done a modest amount of canoing before, but this was the first time we were ever in kayaks with rudders. We had a great time playing with these, you pushed with your right foot to turn right, and left to turn left. Unfortunately, the old sailors instinct that you turn the tiller left to turn right was strong in both of us, so we kept turning the wrong way. We paddled off towards the point opposite the launching ramp. The day was overcast (this is a good thing in summer, paddling for an hour and a half under fierce Sun is not as much fun as you might think), the air still and we glided across the water with faint plashes, even SmallestOne was entranced. We watched a pod of dolphins in the distance, and became more excited as they swam close by us. We followed in their wake at a respectable distance as they were going upstream feeding (you don't want to get too close, so you don't spook them, and they were heading in the direction we wanted to go to reach the mangrove forrest anyway). The all of a sudden there was another pod around us, dolphins were swimming under us and surfacing within arms reach. We shipped oars and sat quietly watching them splash and play around us. (Stuart, we were very careful not to hit the dolphins with a paddle). We just floated on the water appreciating these magnificent animals as they swam around us (there was even a young one in the pod), then swam off on their own business. That magical moment stayed with us as we headed off to the mangrove forrest. For the rest of the trip, SmallestOne would burst out excitedly "Dolphins! BAABBBYYY Dolphins". It was a truly magnificent birthday gift. Western horizon as seen from Southern Hemisphere at 9:30 pm local daylight saving time. Click image to enlarge. 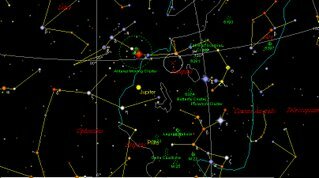 The red circle shows the location of the variable star Mira. Mira is at maxium at the moment. Mira is an iconic variable star, the second one to be described. Mira is a red giant that pulsates over a period of about 331 days, and whose magnitude can rise to s much as 2.0 and fall as low as 10.00 (well below unaided eye visibiliyy). 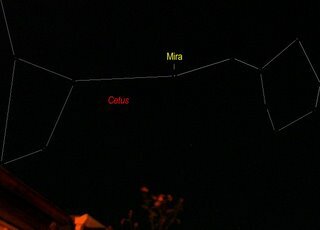 For most of the year Mira is hard to see or too dim to see with the unaided eye. Currently it is around magnitude 2, not startlingly bright, but bright enough to see near the end of nautical twilight without any difficulty. Here is a great APOD image from the northern hemisphere. If you watch over a couple of weeks you can see Mira fade from view. 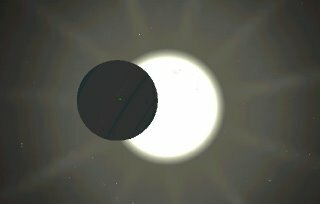 If you like you can try and plot the changes in brightness. On February 25th, my natal day, the Rosetta space probe, ESA's mission to comet Churyumov-Gerasimenko, will make its closest approach to Mars. Rosetta will deloy several instruments, as well as planetary camreas, as it passes withinn 250 Km of Mars to boost it on the next part of its mission. Unfortunately, while media are invited to the event, there is no indication if there will be a live webcast, otherwise I woould spend part of my birthday morning watching this. Stuart reports on the dynamics of the flyby, and Tom outlines an interesting science mission. 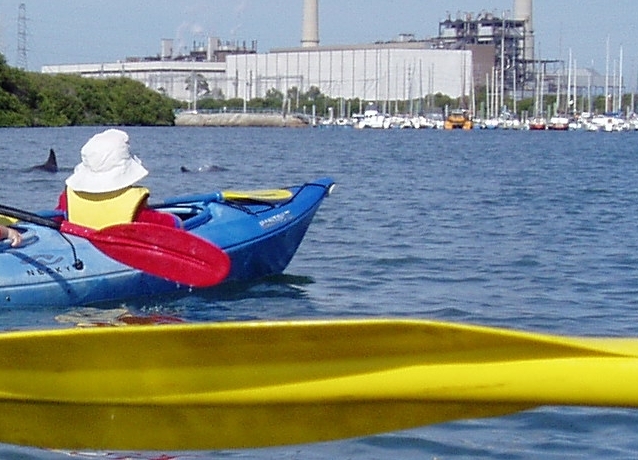 My families present to me is a morning sea kayaking in the dolphin sanctuary. Don't I have the best family ever! The mysterious glowing cloud in space, looks like it is the result of the explosion of a derelict rocket booster. The Bad Astronomer has a animation from Rob McNaught. As the BA says, there are some amazing images over at SpaceWeather. UPDATE: and there is a good image at APOD as well. 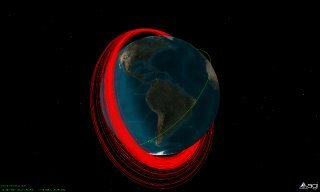 UPDATE to UPDATE: New Scientist reports that this may be the worst debris event ever, even outstripping the Chinese anti-satellite test. The debris is on an eliptical orbit, and may endanger satellites. The crescent Moon and Venus in the late twliight. 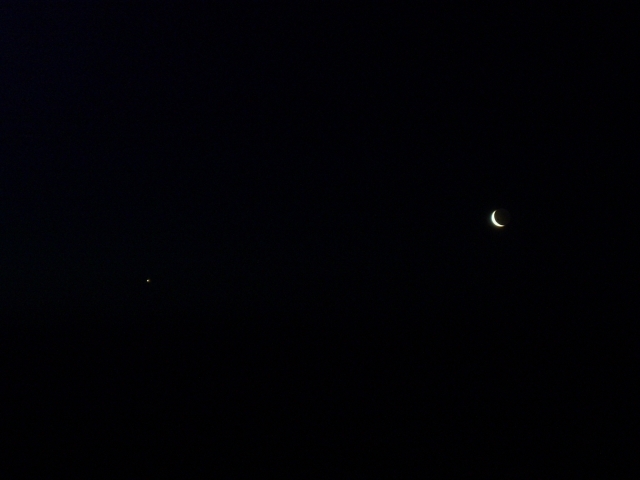 I particularly like the refections of the crescent Moon in the ocean. Oh, yeah, you can't see that. For some reason (I am sure I had it on night mode, it was taking 6 second exposures) the camrea didn't pick up the low level light. The clouors of the sky, the ocean/sky interface, the moon in the waves. Nothing. GAAHHH. Still I saw it though, and it was beautiful, but you have to take my word for it. Nova Scorpii 2007 (V1280 Scorpii) has faded to around magnitude 4.5. A bit difficult under suburban skies to the unaided eye, but easy with binoculars. This spotters map will help, and my previous picture gives a good idea of the location as well. For some northern hemipshere images see here. And tomorrow APOD will have a nova image. I've had some enquiries about a strange glowing cloud in the sky in the early morning. Actually lots of people saw it, according to this ABC report. Gordon Garrad (who took some cracking comet McNaught shots) got some pictures of the cloud, and thought for a while it was a rocket burn from the launch of the Themis satellite. There is a vigorous discussion on Ice in Space, and Gordon has been in touch with the Themis team, who reckon that it wasn't their ship. So what is it? Odds are a rocket burn of some sort, but which one? ... and now you don't. Looks like nobody saw the occultation of a star by the asteroid TARDIS. So for your enjoument I pesent a very nice YouTube video from DaveGee taken near Cowra NSW. To quote Dave from the video description "Lunar graze of the star ZC2644 aka SAO 186593 a mag 6.4 star in Sagittarius. You will notice the star disappear behind lunar mountains and reappear in the valleys." 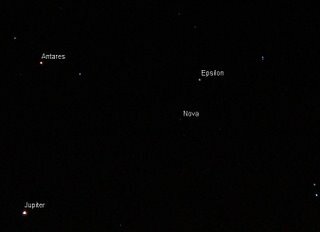 The sky was clouded out this morning, so no nova scorpii. AAVSO reports have it faded to around magnitude 4.5. So here is a picture of Venus and the thin cresent Moon instead. Taken yesterday. Since I don't know how to make "below the fold" type posts in Blogger, this one will go on for a while and scroll some of the Astronomy posts ways down the bottom. 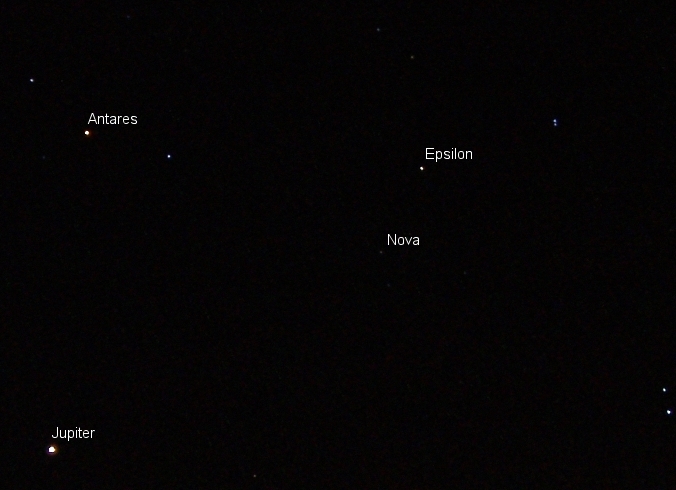 So if you want the Nova spotters chart, go here. If you want to see the latest Nova picture, go here, and if you have a clever way to stop the Earth being consumed during the Sun's Red Giant phase, go here. Now, on with the rant. Well, since the Australian's shameful anti-science editorial, there have been a total of three letters published, all of them supporting the editorial. Now, I find it hard to believe that every Australian letter writer supported the editorial, but the letters that were published are rather sad. First, science advances through critical examination (some would say scepticism) of theories to see whether they really do adequately explain observable facts and events in the real world. Did the author miss this section of the IPCC report? Scientific progress since the TAR is based upon large amounts of new and more comprehensive data, more sophisticated analyses of data, improvements in understanding of processes and their simulation in models, and more extensive exploration of uncertainty ranges. Climate science has advanced to this new, firm consensus by doing science, gathering and testing data. This is the result of 600 scientists distilling the latest published research over the past 6 years. At the very heart of this process is critical examination. Getting researchers to agree on something is like herding cats, and if they do agree, it is after long and exhaustive examination of the data and theories. Anyone can do a quick PubMed search to find the latest data in pre-eminent journals, it’s not like it is hidden. But more depressing was the article in Fridays (16 Feb) Australian, apparently quoting Liberal MP Dennis Jensen in parliament. It is all the more sad as Jensen holds a degree in Applied Physics, a PhD and worked as a researcher at DSTO (and otherwise says quite sensible things). [IPCC 90% certainty of anthropogenic component] Sounds good, but that is nowhere near certain in scientific terms. Nothing is ever certain in scientific terms. All we can say is that the balance of probabilities is in a hypotheses favour. While Jensen, as a physicist, may be disparaging of 90% certainty, many scientific fields would be envious of a 90% certainty. We have less certainty that prions are responsible for the variant Jacob Creutzfeldt disease (vCJD) that has killed people in the UK, but massive culls of animals, altered animal carcass handling and altered dietary habits have been put in place on the basis of the evidence we did have. Aside from the issue that no scientific conclusion is ever beyond doubt (that is what makes science science, after all), he is conflating statistical inference of cause with statistical prediction on the basis of past events. This might sound a bit pedantic, but it alters how we approach the conclusions significantly (the question is not, given past performance, will Australia win further matches, but that in the test series where they won lots of matches, was that winning streak was due to then being more skilful than the English or some other factor. I will not even attempt to address Bayesian priors, at the risk of exploding reader’s heads). The conclusion that anthropogenic causes are responsible for the major part of recent global warming is due to a process of inference. In the same way that we infer that Joe Bloggs broke into your house, by a process of inference from the fact he is a known break and enter felon, he was seen near your house at the estimated time of the break-in, foot prints that match his shoes were found at the scene, fragments of glass with the same chemical signature as the glass in your broken window are found in his clothes. Now, you might like more evidence (he may have been passing by innocently to the 7-11 for some putty to fix a broken window pane that co-incidentally has the same chemical signature as yours as it comes from the same manufacturer), but in civil trials 90% certainty will get you convicted. Similarly, we can say on the basis of the evidence seen in test series that Australia won its matches due to being more skilful than the English, not due to a voodoo curse on the English (although the English might not feel that way). In the case of anthropogenic causes of global warming, we know that carbon dioxide and methane etc. are greenhouse gasses, the relentless logic of Arrhenius' greenhouse law (which is why Earth isn’t a frozen lump) means that temperature must rise if their concentration increases. We have humans pumping unprecedented levels of greenhouse gasses into the atmosphere. The observed rise correlates strongly with the input of our greenhouse gasses, and not with any other cause. There is lots more evidence of course (See the IPCC reports and real climate for further details), and there is a lot research minutely examining all possible causes of temperature rise. Also, keep in mind the IPCC took a very conservative approach to estimating likelihood, so the links are actually underplayed. Again, none of this inferential process is 100% certain, science never is. With any scientific process we must always operate at less than 100% certainty. Now the flip side of this is the prediction aspect, which is what Jensen actually gives and example of. Given the success of the Australian team in the test, you would be reasonably confident that Australia would win the one-day series (actually, calculating the Bayesian priors for this is fairly tricky, and the outcome is far less certain than you would think, but you would not be amiss in wagering a small sum on the outcome). They didn’t, and the only loss was a bit of pride and some bruised egos. On the other hand, consider this scenario, you are the Mayor of a coastal city, there is a category 5 cyclone coming. At the failsafe point, the last time when you can successfully organise an evacuation of the city, there is a 90% probability that the cyclone will pass directly over the city. What do you do, do you ignore it, because 90% isn’t certain? Or do you evacuate, with the attendant problems that will cause? Most people will evacuate, because the harm caused by being right (having your city flattened by a cyclone) greatly outweighs the harm caused by being wrong (the chaos of evacuation when the cyclone passes “harmlessly” to one side). The British beef industry was turned upside down with a smaller degree of certainty than the evidence for anthropogenic inputs to global warming, because the public health was in clear and present danger despite the small number of actual and predicted deaths (and subsequent research shows they were right to do so). A recent South Australian example where policy was implemented on far less than 100% certainty was the case of tracing the source of bacterial infection to a meat supplier. In terms of climate change, we are at or near the failsafe point now, the greenhouse gasses we emit now will affect the climate for decades to come. Unlike vCJD or toxic E. coli, the major harms lie in the futures of our children and grandchildren (between 2040 to 2060), so we are somewhat less exercised about them. However, it is not the case that we have the luxury of waiting until we are 95% certain (how would you feel if the Health authorities stated, “we are only 90% certain the bacterial contamination came from this source, so we will wait until we are 95% certain”, probably pretty mad). The lags that happen in the climate means we have to slow down greenhouse gasses now. Vice Chairman Yuri Izrael, commented that "There is no proven link between human activity and global warming." Apart from the fact that proof is for whiskey and mathematics (remember, science does inference to the best explanation on balance of probabilities), why Jensen feels a quote from 2005, 2 years before the new consensus document, has any meaning is puzzling. Especially when the good professor also says “Natural factors and the impact of man seem to be interlinked.” Which nobody at the IPCC would disagree with. He also says "Global temperatures will likely rise by 1.4-5.8 degrees during the next 100 years." Again, this is not good news for global warming deniers, and of course has been superseded by the 2007 consensus. He also says “In my opinion, academics, politicians and governments should assess maximum permissible temperatures and carbon-dioxide levels. Quite possibly, the world would have to sacrifice something in the face of a common threat”. Again, this is two years before the current data, but still indicates that global action will needed to be taken to combat global warming. Not exactly the picture Jensen wants to promote. What is it with Michael Crichton and these people; he’s a novelist for Zarquon’s sake! Why would one accept the word of a novelist, one that has made fundamental mistakes in portraying climate and climate science, over the actual scientists that work in the climate field? Michael Crichton writes a cracking good novel, but he is not a scientific researcher (even if he was a medical doctor around 30 years ago). Tim Flannery is a bona-fide researcher, with a strong track record of research behind him, who has written some cracking non-fiction books. Yet when he puts his spoke in, he gets vilified by the global warming deniers. Crichton, a non-scientist who makes appalling egregious mistakes when he writes on climate, gets elevated to near saint hood. And still they don’t actually talk to climate research scientists. You know, the ones who actually do all that science stuff with data and what not. Now, Crichton is a fair bit older than me (I read “The Andromeda Strain” in high school and was fascinated by it), but unless he is a really well preserved 90 year old, he can’t have been around during the eugenics discussion of the 20’s and 30’s (and remember them, a precocious 10 year old might just remember eugenics discussions in the 30’s). Eugenics was, by our standards today, rather bizarre, but it was a confluence of several themes around public health. Eugenics was supported by a broad coalition of conservative and liberal politicians, and the general public, based on pre-genetics concepts of “breeding” and a melding with the new science of genetics. There was no “pressure” on scientists to accept it (although some scientists promoted it, Galton being a major champion of encouraging “good” couples to breed). The acceptance and practice of eugenics legislation was complex (and the history of eugenics veru complex see Kevles, D. J. (1995), In the Name of Eugenics: Genetics and the uses of human heredity. Revised ed. Cambridge, Mass: Harvard University Press.) , worked differently in different continents and states, and in many cases was a shameful farce. In the climate debate, there is no pressure on scientists to accept the scientific consensus as the gospel truth. It is the accumulated knowledge and data, generated by over 600 working scientists, that is driving scientists to the consensus. One may was well rail against physicists pushing relativity on the basis of their concensus. Crichton is a poor source for information about science. I doubt that physicist Jensen would cite Crichton for information on nanotechnology (despite "Prey" being a good airport novel, the nanotechnogy stuff is well, farfetched shall we say), so why quote him on climate science? What is sad is that people who should know better (and Jensen is a person who I would largely agree with on other science topics, if his speaches are anytihing to go by) misrepresent science, and listen to novelists, rather than try and get to grips with the science and this issues that confront us in the coming decades. Again, you will have to click on the thumbnail image to the left to actually see the nova. Stack of 3 x 6 second images in The Gimp, taken aound 4:10 am ACST with an Olympus mu:300. Compare to the spotters map here. It was much easier to see Nova Scorpii 2007 this morning. Knowing where to look helped, as did turning off all the lights to keep my dark adaption going. But best of all, the cool change had come through, and the sky was far more transparent and had no annoying cloud. The milky way was fairly clear, and I did not need to use averted vision to see the Nova (although it was much clearer in averted vision). My impression this morning was that it had not faded (or at least only marginally) and was still around magnitude 4.2. The nova has been reported to be redish, if that is so, since I am red/green colour blind, it's probablly a bit brighter. The prospects for the nova being visible to the unaided eye tommorow morning is good. EldestOne is rather perturbed that the Sun will expand to a red Giant Stage and destroy the Earth. Of course, while that is some billions of years off, Earth will become uninhabitable long before then, as the Sun expands. EldestOne has had a hard time sleeping because of this (I did the same thing at his age, so I understand). So, the task for my readers is: Come up with a way to save the Earth from its impending doom! The best entry (as judged by EldestOne) will win a copy of Sky&Space magazine. So put your thinking caps on, and see what you can come up with. Nova Scorpii 2007 imgaged! Click on image to enlarge it so you can see the Nova. 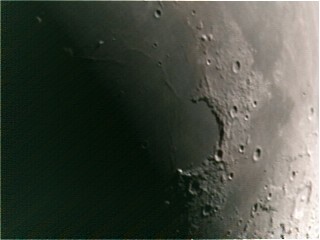 The image was taken 4:30 am ACDST, and is a stack of 4 x 6 second exposures with an Olympus mu:300 digital. Images had dark frames subtracted and were stacked in The Gimp. Having staggered out at 4:00 am, I actually saw it. Just, seeing conditions here were awful, with lots of high hazy cloud and skyglow. 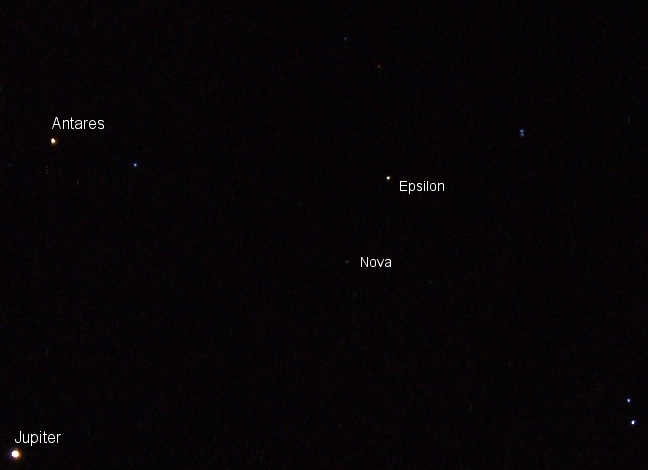 But after my eyes got adjusted I could see the nova easily with averted vision, and just with direct vision. It was very obvious in binoculars. I think it may have faded a little, it looked to be about magnitude 4.2 rather than 3.7, but with messy skies who knows. Comparison stars were TYC 7884-2876-1 (4.27), TYC 7353-3153-1(4.18), TYC 7353-3152-1 (4.22) and TYC 7368-1546-1 (4.87). My estimate of 4.2 isn't too far off from recent AAVSO reports. See also the Ice in Space Threads. New Unaided eye Nova in Scorpius!!! Map of the eastern horizon in the Southern hemisphere at around 2:20 am (daylight saving time). 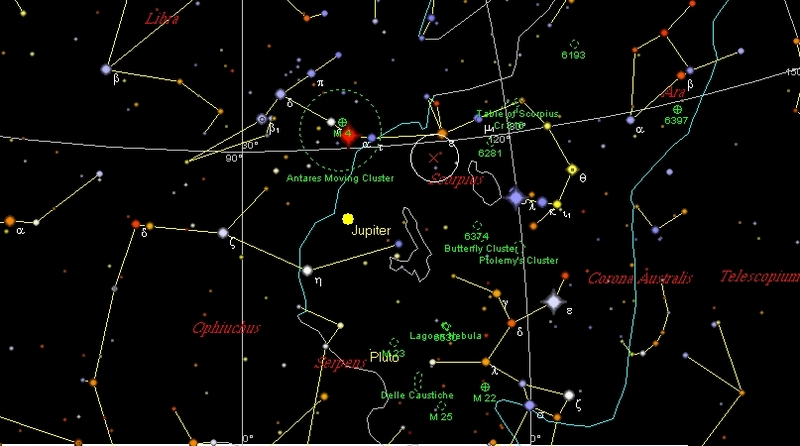 The circle shows the field of view of a pair of 10x50 binoculars, the red cross shows the approximate location of the Nova. Click image for a larger Map. It is currently magnitude 3.7, about as brigh as epsilon Crucis, the fifth star in the Southern Cross, and a bit dimmer than epsilon Scorpii, the star it is underneath. It should be easily visible to the unaided eye from all Australian locations, the unfortunate thing is that you have to get up at at between 2:oo am to 4:30 am to see it. Occulatations of stars by astroids are surprisingly common, occulataions of stars visible to the unaided eye are not. 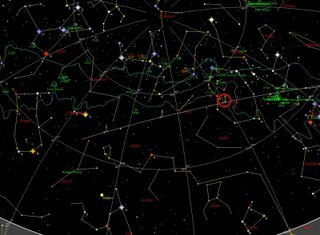 On the early morning of Saturday, Feb 16, the Asteroid 3325 TARDIS will pass in front of a Magnitude 4.6 star. 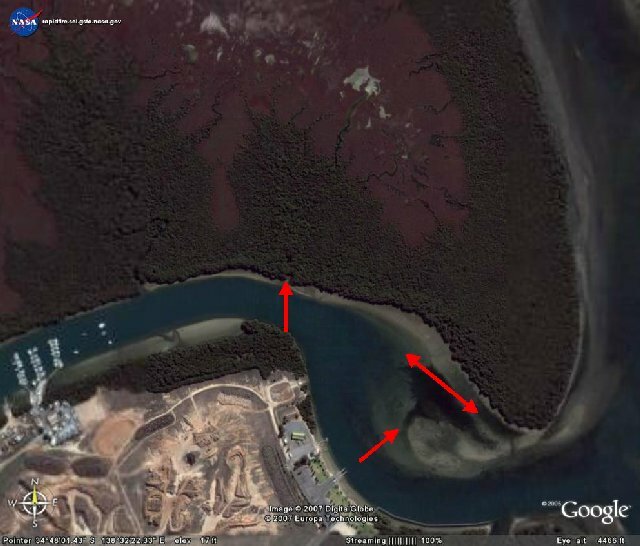 There is a great Google Map showing where this will be visible from (lots of places in Australia). The downside is that the dip in brightness last about 1.4 seconds and that it occures 3:16 am AEDST. The Australian is Anti-Science, it's a conclusion I'm reluctant to draw, but the accumulated evidence drives me to it. Science must not become a slave to its own orthodoxies, begins this editorial in todays Australian. Mmmm, Science as Orthodoxy, now where have I heard that before? It's the standard tactic used by Intelligent Design Creationists, HIV deniers and anti-vaccination folks. This isn't a good start, not helped by the anti-IPCC rant from some Polish politician given space on the same page. Look, the IPCC report is the distillation of over 15 years of research, compiled by over a thousand international scientists, it's not orthodoxy, it is evidence, carefully collected, intensely studied evidence. But on the other hand there is a growing chorus of murmurs against the received orthodoxy of climate change. Ah, just like the creationists, there is always a claim of growing opposition (which somehow is never identified with actual people), but in fact many climate skeptics have ceased their skepticism, or have switched to economic arguments, instead of denying the reality of global warming (there is a good article in Nature on this, but it is subscription only). While the recent IPCC report was held up as the last word on the subject, many scientists have pointed out that the 90 per cent certainty ascribed to the reports findings is in scientific terms not very certain at all. For example, at the Danish National Space Centre in 2005 an experiment successfully linked cosmic rays to the formation of clouds. .... At the same time it provides a more satisfactory explanation for contradictory Antarctic temperature trends that cannot be explained by conventional greenhouse global warming models. Yes, this is all very well and good, a nice interesting contribution to long term climate. But it doesn't explain the Antarctic data (which aren't contradictory) because cosmic ray levels haven't changed significantly, they are not relevant to the warming we are currently experiencing. It's like the near-religious fervour with which scientists defend the fact that Earth is an oblate spheroid, or gravity, it's a fact of physics you can't get way from. An editor may have their own opinions, but they don't get to have their own facts. It was skepticism that led Copernicus to challenge contemporary orthodoxy and assert that the Earth is not the centre of the universe. Well, chalk up ignorance of history as well, but trying to hijack the Copernican movement backfires. Galileo had significant problems convincing people of his ideas as many were not prepared to look at the evidence, in some cases refusing to look through his telescope to see things for themselves. In the global warming arena, scientists have produced massive amounts of evidence, only to be ignored by political leaders and editors of the Australian. The position of scientists is not the orthodoxy, the orthodoxy is that of the politicians who claim that humans aren't changing climate. The editors response to the massive amount of evidence appears to be sticking their fingers in their ears and saying "nayh-nayh can't hear you". The fact is that our climate is infinitely complex. No, it is finitely complex, very very complex, but finitely so. Here the editor is trying a "scientists can never know" tactic. Our models may be crude, but when several different models give the same predictions, and the predictions have been closely tracked by real temperature rises, you better take them seriously. And scientists are often woefully out of their depth in the real world. Funny, when I was making my kids lunches this morning, I was sure I was in the real world, and not doing too bad a job of making the lunches. Scientists do just fine in the real world dear editor, the computer you typed your missive on, the mobile phone you use, the car you drive are all products of scientists producing real world solutions to real world problems. History is littered with lives and regimes that were wrecked when science was allowed to drive policy with no thought to humanity. Yeah, like the campaign to eliminate small pox, that certainly wrecked a lot of lives and not a few regimes, and the campaign to bring clean drinking water to everyone, and the weather satellites that give people decent warning of approaching storms, the "slip slop slap" campaign to prevent suncancer did in a few regimes too. Stopping production of CFC's before the ozone layer disappeared has caused untold misery and wrecked several regimes. That was sarcasm if you didn't realise. Science drive policy, we wish. It has never happened, and is unlikely to happen. Oh sure, bad and/or foolish people will co-opt science to support their irrational campaign du jour (like the campaign of forced sterilization for "mental defectives" in the United States in the 20's and 30's, it was a political movement that coopted science, not a science driven policy). The argument that Scientists have done bad /foolish things in the past, therefore we should ignore the weight of evidence before us now, is not a logical one. The editor can't come up with real counter arguments to the evidence arrayed by scientists, so now resorts to ad-hominems. It is only by tempering science with economics and the market, which is the most efficient arbiter of humanity's wants and needs, that smart climate policy can be made. Yeah, right. That worked so well with fish stocks, you know the ones scientists said needed to be harvested at lower levels to be sustainable. The politicians and economists ignored them, the fish stocks crashed, and so far haven't recovered. The same song was sung over CFC's and ozone depletion, giving in to alarmist scientists would ruin us, claimed industry and economists. Then the NASA images of the ozone hole came out, and suddenly CFC's were replaced and the economy hasn't collapsed. Mysterious murmurings of unnamed "scientists", non sequiturs, rants about "evil" scientists, all tactics I know and loath from the creationists, HIV deniers and anti-vax people. If this was some tabloid journal I would expect this, but this is the National broadsheet newspaper, we really should expect better. On the other hand, the Australian has a history of letting Intelligent design creationism romp all over its pages, and has published appalling pieces of nonsense about global warming. I've written about this before. So one is left to conclude that the Australian (or rather its editors), is anti-science. A very sad fate for the premier national newspaper. At a time when we need our citizens to be scientifically literate, especially as we try to sort out effective response to global warming, we have The Australian peddling nonsense to them. 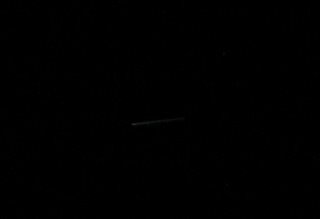 In my ongoing campaign to image Iridium flares with my digital camera, I caught this one last night, not the best, the flare was supposed to be -4, but looked dimmer than the -2 one last night. Well, you can see that it is Saturn, but when the stars are twinkling up near the zenith, you know that spells disaster for astrophotography, especially when Saturn is no more than 30 degress above the horizon. Still have to work on the focus and collimation a bit too, methinks. Reknown biologist Charles Darwin was born on this day in 1809. Darwin Day celebrates his life and achievements. There may be a Darwin Day Event near you! Well, I've finally got my scope prepped (although I'm not too happy with the colimation). The hardest part was getting the finder scope realined with the field of view of the main scope. This may seem trivial, but when you are struggling to get a tiny dot in the very narrow CCD frame, it can end hours of frustration. Anyway, I'v done a test shot of the Moon and Jupiter (the two faint dots are Ganymede and Europa). Seeing was not fantastic, skies clear but fairly turbulent, even pretty high up in the sky. 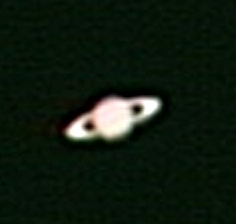 Still, the images aren't too bad, so tonight I'll go after Saturn. Stuart leads off with news of progress with the Plank Spacecraft, which will probe the cosmic microwave background more closely than before. The Bad Astronomer has a marvelous post on gamma rays from monster stars, Tom gets excited by Ulysses visiting the South Pole of the Sun. Both Tom and the Bad Astronomer get excited by Hubbles images of Abell S0740, but only Tom offers Able wallpapers. Tag Starhops down memory lane. Cassini has discovered a cloud the size of Australia on the north pole of Titan. Enceladus is sandblasting neighbouring Moons, and the early Earth has its temperature taken. The northwestern horizon as seen from Adelaide at 21:50 ACDST, the red circle shows the location of the flare (click to enlarge). 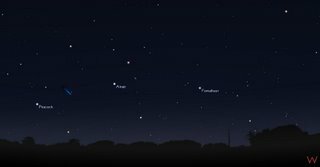 If you are up tonight looking at Saturn on the night of its opposition, then have a look around 21:50, and you may see an Iridium flare. In Adeliade there is one at 21:50 ACDST, and one in Melbourne at 21:50 AEDST (from different iridium satellites) at -2 magnitude. Check Heavens Above for your local details. There is a -3 magnitude flare at roughly 21:40 in a similar position on Monday night as well. 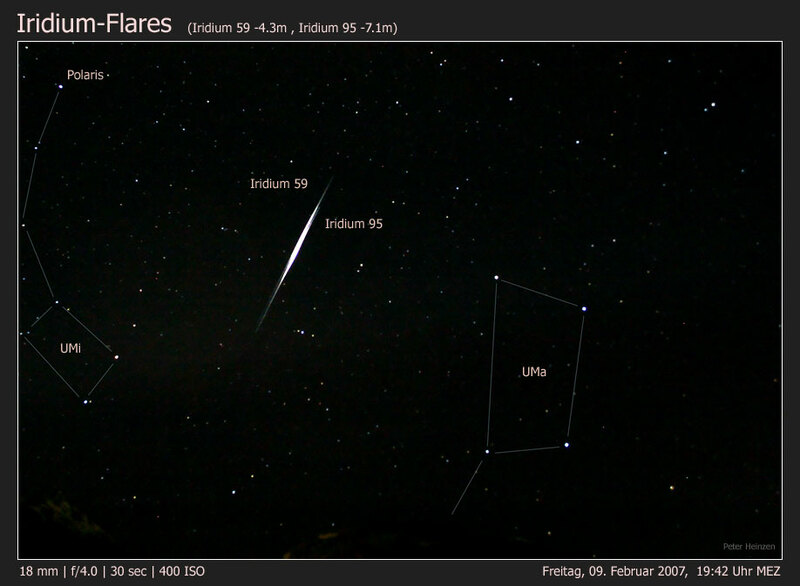 Speaking of Iridium flares, check out Spaceweather for a rare shot of a double Iridium flare. Another great picture from Peter Hienzen of a double flare, almost one on top of each other is here. UPDATE: Freaking Heck! I just saw a double flare! Well, it wasn't as spectacular as the images linked to above, but it was pretty amazing. 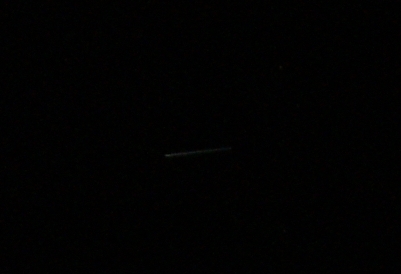 Iridium 36 and iridium 97 were travelling in parallel, aparently close together. Iridium 36 did a sustained flare, but Iridium 97 did two quick bright flashes. That was strange happening so soon after reading about it. 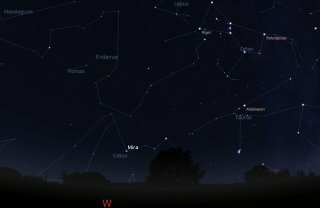 The Northern sky as seen from the Southern Hemisphere at roughly midnight (click image to enlarge). Golden Saturn is not far from bright Regulus, above the sickle of Leo. 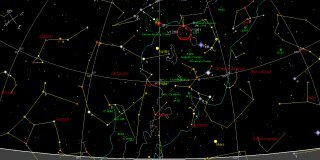 Saturn is at opposition on Sunday, February 11. 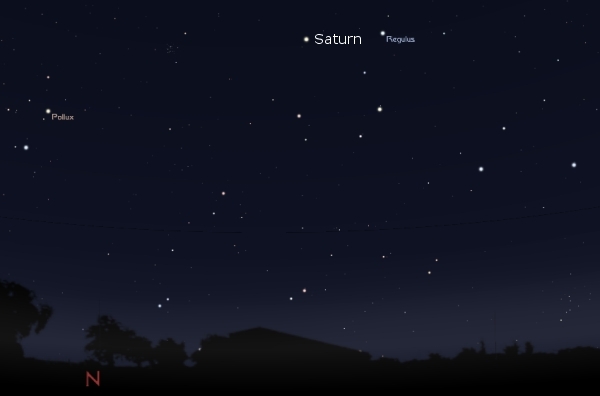 At this time, Saturn will be at its brightest and will appear at its largest in telescopes. This ringed world is always a joy to behold, but at and around opposition, Saturn is at its best in even small telescopes. 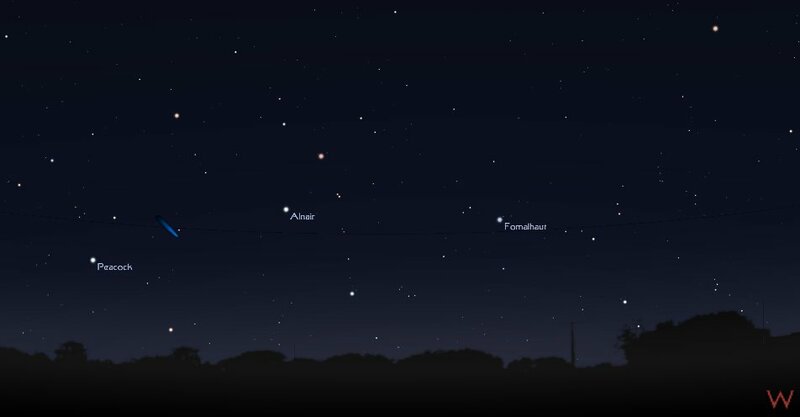 While biggest and brightest on Sunday, because Saturn's apparent size doesn't change much over its orbit, it will be good viewing for all of February and March. 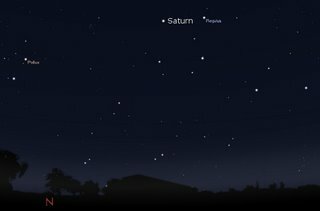 The main issue is that now Saturn can be seen sufficiently high above the horizon in the late evening than non-insomniacs can view it in a telescope, while Saturn rises around 7 pm, it remains close to the horizon until after 10:00 pm, where the roiling of the atmosphere makes viewing frustrating. Saturns rings are also closing up, by 2010 the rings will be edge on, so this will be the last time for several years to see the rings displayed well. So if have a telescope, drag it out and dust it off. If not, find a friend or relative with one and cadge a look off them. Otherwise, why not pop into one of your local observatory or planetariums viewing days, or the local Astronomical Societies' open nights. It will be worth it. Mercury is at its greatest distance from the Sun tomorrow. Unfortunately, because the ecliptic (the path the planets take through the sky) is angled well away from vertical, this means that Mercury nevet gets much more than about 3 degrees above the horizon half an hour after sunset (the image to the left makes everything to dark, the sky will be much lighter, but I was having trouble the the daylight emulation in the program). Unless you live in Darwin, where it will be about one and a half handspans above the horizon. But anyway, for the rest of us, seeing Mercury this time round will need a clear level horizon, like the sea or the desert or some such. I went down the beach two nights in a row and I clouldn't see it due to cloud on the horizon. But with Venus above and the play of light between the sea and the cloud, it was pretty good anyway. And that is saying something. Run, don't walk to Astronomy Post of the Day and check out this astounding picture taken on Australia Day, you can see the guy's photogallery here. You will need to click on the image to enlarge it. Want to get a feel for the scale of the planets and stars? This little video, "Earth vs the Universe" will get you started. There is a fresh Jodcast, with Sir Bernard Lovell talking about the origins of the MKI telescope at Jodrell Bank, and the lowdown on STEREO. Speaking of history, Tom salutes Luna 9. Tom, Stuart and Emily Lakadwalla both show amazing images of Saturn taken from above (Tom here, Stuart here and Emily here). Tom and Emily report even more amazing images for Jupiter taken by the Mars Reconaissance Orbiter's HiRISE camera (Tom here, Emily here). Emily also has a nice animation of clouds on Mars. New Scientist reports the first global maps of night time cloud on Mars. New Scientist also reprots on dramatic gullies on Mars taken by the Mars Reconaissance Orbiter. 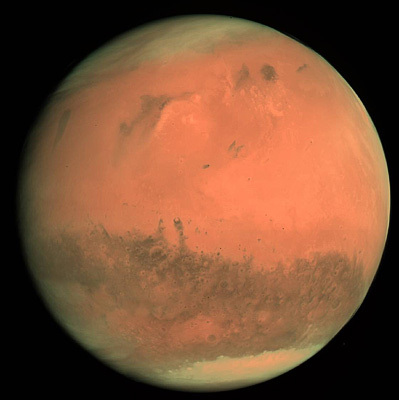 The Journal Science reports that life on Mars may be hiding deep below the surface. Stuart reports on the demise of the Hubbles Advanced Camera for Surveys, see also here, and calls for its repair here. DaveP has some great shots of sundogs, Ice In Space has an interview with Rob McNaught, the discoverer of teh marvellous comet, anddon't forget the Ice In Space comet image forums. Another great image taken by Tony Travaglia of New Zealand (taken on Feb 1, I think). Comet McNaught has been difficult to see in the Moonlight, last night I could just pick it up by averted vision in my suburban location. Nonetheless it is great in binoculars. This image taken last night by Graham Parker in New Zealand is pretty spectacular, but does have a 69 second exposure. Now that the Moon is rising later, the tail of McNaught should become more obvious, tonight I could see the comet as a dim streak an hour an 10 minutes after sunset, with about a handspan of tail. So keep on looking folks. If you have just come out of the house, you will need to allow your eyes to adjust for a few minutes. Doing some sweeps with binoculars will help you locate the comet while your eyes adjust. I've got two more rolls of film to process, so I'll put up some more images later. (and I'm working on a post on the science of McNaught). Here is an interesting image of the head of McNaught. An, as a teaser for the "science post", here is an image of the striae, which I will explain then. Image Credit: STK-generated image courtesy of CSSI. On 11 January the Chinese blasted one of their old weather satellites with an anti-satellite weapon. This was pretty big news, my local rag, not noted for science coverage, devoted two whole pages to the event. At the time, NASA calimed the debris cloud from the test would not affect the ISS. Around 500 trackable pieces of debris were produced from the demolition of the satellite. A new analysis of their orbits, performed by Dr. Thomas Kelso of the Center for Space Standards and Innovation, suggests that the ISS is indeed in danger. The report shows that the ISS passes throgh the ring of debris on the southern part of its orbit. High resolution graphics and animations can be found here. Other Low Earth Orbit satellites arre in danger too. There is a tool on the anaylsis site for checking close passes (type in FENGYUN 1C DEB), and the number of debris satellite interactions is very scary. 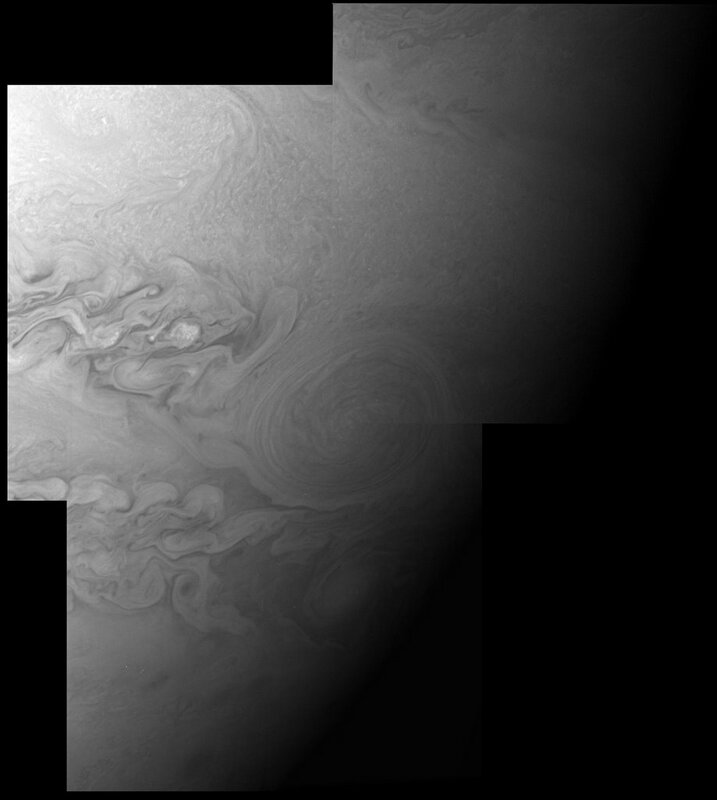 This image of Jupiters atmosphere is a composite of 11 images taken once an hour by the LORRI camera of New Horizons, the Pluto-Kupier Belt Mission. In 25 days New Horizons will be at its closest approach to Jupiter, so expect some really good images then. At the moment, this gallery of shots is pretty impresssive. This is old news now, but as the comet McNaught frenzy dies down, I can blog about other things now. 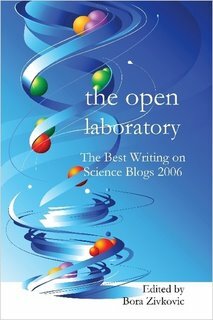 Bora of Blog around the Clock has put together an anthology of the best Science Blog writing of 2006. One of my essays, on the "design" of squid and human eyes, is included. If you ahve aburning desire to own some of the ebst blog writing on science, you can buy it here. The southern horizon an hour before sunrise, (click to enlarge). Comet McNaught is getting dimmer, and the bright Moon doesn't help. 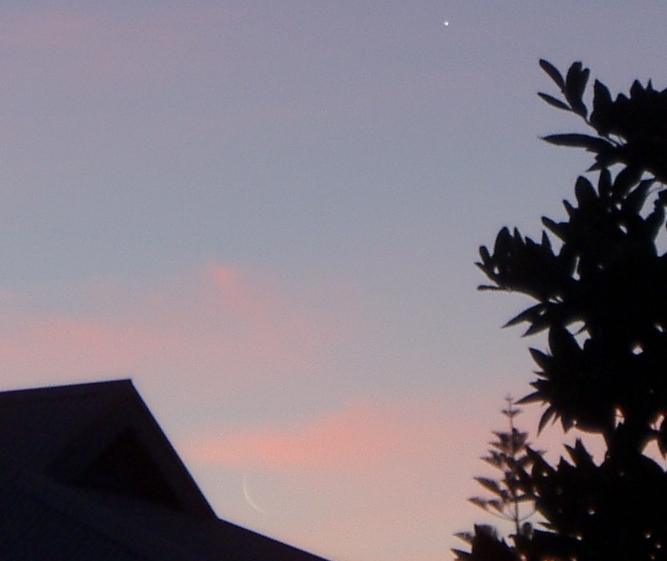 But I can still see McNaught as a pale streak against the sky about an hour after sunset. It looks good in binoculars. 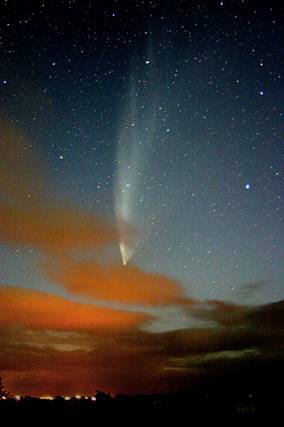 McNaught is also visible in the morning, here is an image by Wil Godward, and here is a lovely series from John Drummond in New Zealand. If you can't get up in the morning, don't worry. The comet will visible for at least the rest of the week, especially as the Moon rises later. After that, you may need binoculars. Our guests have departed (sadly) but now I have my office back, so I have a backlog of postings to work through. In 1835 Dr. August Comte said humans could never know the chemical composition of the stars. About twenty years later Kirchhoff invented the spectroscope, and the chemical composition of the stars was laid bare in bands of light. Then it was thought we would never know if there were planets around other suns, now we have over 200 of the blasted things. HD 209458b is an iconic exoplanet, because it is one of only two exoplanets that have had some of the composition of their atmopshere determined. This is because it is a transiting Exoplanet, where it passes in from of its sun from our point of view, and we can take spectra of it. Not so surprisingly, there is hydrogen, but also oxygen, carbon and sodium. But more than that, being close to its star it is backingly hot, and its atmosphere trails behind it like a comet. But until now, researchers couldn't accout for how fast it was leaking gas. 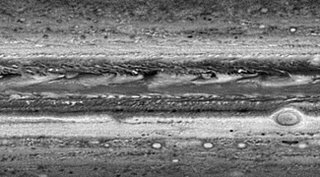 Now a new paper in the journal Nature has reported measurements of a hot layer of hydrogen in the planets atmosphere that drives the loss of gas. In a decade we have gone form being able to detect exoplanets, to being able to determine the composition and structure of their atmospheres. That is cool (or hot). The February Edition of Southern Skywatch is up. The Moon visits Mars and Venus, and comes close to M75. 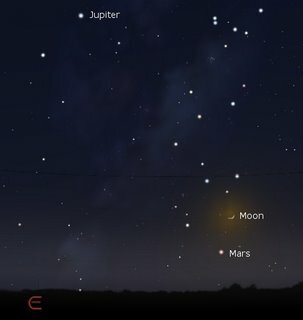 There a new spotters map for comet McNaught, and of course there is the opposition of Saturn. This is your last chance to see the rings wide open for around a decade, so go beg or borrow a telescope and have a look.